I am glad that you could join me for Avoid Temptation Tuesday. My Tuesday posts are designed to help us identify sin and negative behavior we would like to get rid of. Today we will talk about fear. Some people call this a sin and others call it an emotion. I believe that fear can be a sin when it controls our lives and begins to dictate how we function through our day to day lives. The Bible says that we are to fear God so this type of fear would not be a sin. 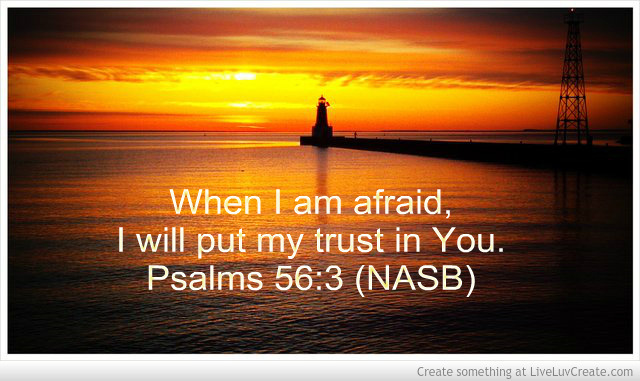 If you fears are caused because you do not trust the Lord, then this would be a sin. The best way to determine if you fear is a sin is to study the Bible to see what it has to say about fear and then pray about it. If you are convicted of your fear, then confess it as sin. Some people have so much fear in their lives that it might prevent them from getting out of bed. Some fears seem justifiable if you are in a dangerous situation, so I am not here to judge whether you fear is a sin. This is between you and God. It is possible to get over fears so I hope I can help you with this. 1. Admit to God that you have fear of ______________________________________. 3. Try memorizing these verses so you can quote them whenever you have fear. 4. Realize that God does not give us a spirit of fear (2 Tim 1:7 (NKJV)). 5. If fear does not come from God, then it comes from Satan so rebuke it like this: Fearful thoughts, I rebuke you now in the name of Jesus Christ. Leave and do not return. 6. Every time a fearful thought comes to your mind, then rebuke it in the name of Jesus Christ. 7. Now study and memorize scriptures which teach you to trust the Lord. 8. Pray and ask the Lord to remove your fears and place it with faith and trust in him. 9. Now pray for the Lord’s protection over you and your family. I promise if you do this, you will soon realize that your fears are gone. If we are to pray for the Lord’s protection over us, then we need to combat our fears and put our faith and trust in him. Thank you for visiting my blog. I am so glad that I was able to help you.